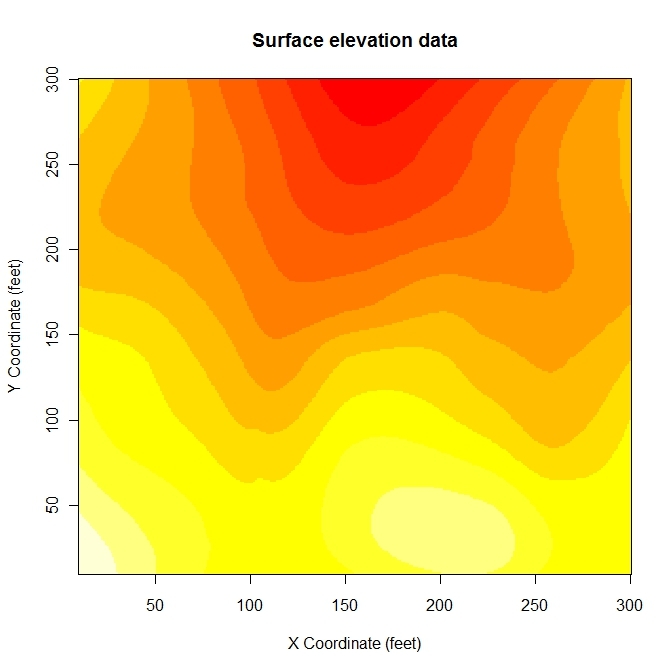 A level plot is a type of graph that is used to display a surface in two rather than three dimensions – the surface is viewed from above as if we were looking straight down and is an alternative to a contour plot – geographic data is an example of where this type of graph would be used. 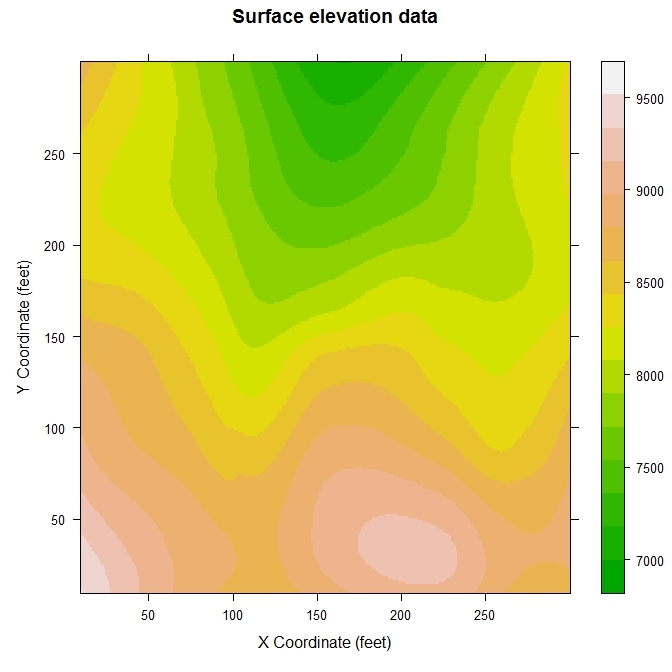 A contour plot uses lines to identify regions of different heights and the level plot uses coloured regions to produce a similar effect. For some packages we need the call to the data function to make a set of data available for our use. The elevation object is not a data frame so our first step is to create our own data frame to be used to create the level plots using the different graphics packages. The data is now in a format that can be used to create the level plots in the various packages. The function image in the base graphics package is the function we use to create a level plot. This function requires a list of x and y values that cover the grid of vertical values that will be used to create the surface. These heights are specified as a table of values, which in our case was saved as the object z during the calculations on the local trend surface. The default colour scheme used by the base graphics produces an attractive level plot graph where we can easily see the variation in height across the grid region. 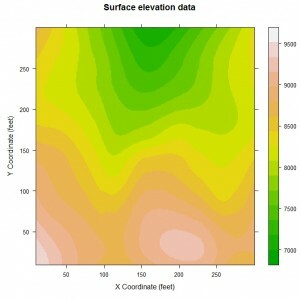 It is basically a fancy version of a contour plot where the regions between the contour lines are coloured with different shades indicating the height in those regions. The lattice graphics package provides a function levelplot for this type of graphical dispaly. 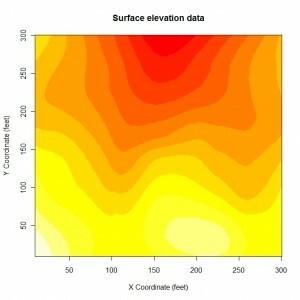 We use the data stored in the object elevation.fit to create the graph with lattice graphics. The formula is used to specify which variable to use for the three axes and a data frame where the values are stored – as there are three dimensions it is the z axis that is specified on the left hand side of the formula. The axes labels and title are specified in the same way as the base graphics. This is in general similar to the base graphics display but the actual plot region is a different shape that makes things look slightly different. The graph from ggplot2 is visually as impressive as the other graphs – there is more smoothing between the colours which blurs some of the lines on the other graphs because of the type of colour gradient that was selected. How do you not get the white lines in your first two images? 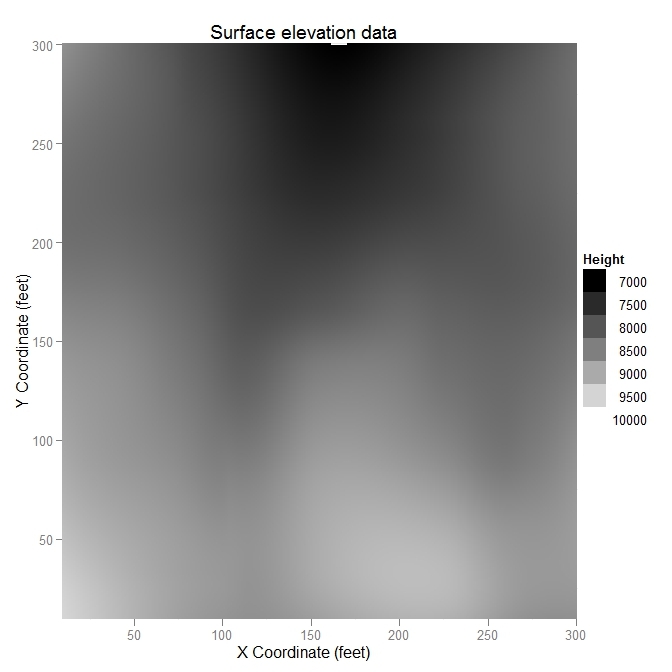 The only way I can prevent white lines in levelplot is to make it a raster image. There is no such option for “image” function that I can see. I am using 64-bit 2.13.1 (2011-07-08) on Win7 64bit. I installed 2.12.2 and the image looks fine. Something was changed in 2.13 that broke the graphing utility. Fair enough. Hopefully that will be fixed when the R 2.13 packages are updated over time. I like that ggplot2 is fairly easy to use, but is it possible, in plots like these, to reverse the dang legend? I’m not sure what the developers were thinking putting the low numbers on top and high numbers on bottom. Honestly, who looks at numbers like that!? I’ve looked through the documentation, but it only focuses on stacked bar charts. Okay. I figured it out. Change the scale fill gradient command to: scale_fill_gradient(limits=c(10000,7000),low=”white”,high=”black”). Essentially, the tag ‘low’ is paired with the first number in limits, and ‘high’ is paired with the second number. It’s a bit too confusing, I think, for a program that is trumpeting its purpose as being easier to use than those “other” packages. Thanks for the great, simple to follow tutorial! Nicely worked out and thanks for sharing here! I agree with your comment that ggplot2 is not as easy to use as advertised. There are many aspects of it that are very good for the user but there are a handful that can be a bit frustrating. How many data points do you have and are they well spread out between the x and y limits?